Inside the monument, the Sun played the leading part on the pavement, on the wall paintings, as well as on the ceiling with various manifestations of its multifaceted action. The details of the Heliocentric System on the floor were most accurately described. It is true, however, that the wall painting and the ceiling surprise the observer with the correlations of the astronomical knowledge, which they factually and symbolically imply. Fortunately, at least part of the pavement of the Tholos has been preserved from vandalisms. The corresponding design (front cover …) is reproduced from the book of the archeologist P. Kavadias, “ History of Greek Art”, volume B, page 461, Doudoumis Publications. This decorative design is not an artistic representation. 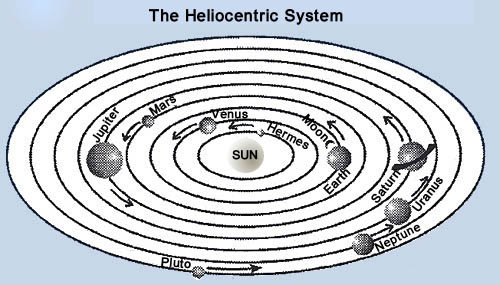 It is the exact reproduction of the Heliocentric System. 40 years before the birth of Aristarchus from Samos, who is reportedly the first to have discovered and explained the Heliocentric System, the monument had already displayed the full details of it on the floor. The erection of the Tholos began in 360 B.C. and Aristarchus was born in 320 B.C. - with regards to the revelation of the Heliocentric System - appears in the interior of the monument. Perhaps the clue to this puzzling question belongs to the Pythagorians, who claimed that the fire of the universe is positioned in the center of the sky, the earth rotates around it along with the other stars (planets). (Aristoteles, “ Peri Ouranou” = About the Celestial Vault). In order for any representation, drawing, thought, idea, concept to be recognizable, it should be first recorded in the memory of the observer (Plato’s “Theaititus”). But even if the visual or conceptual image pre-exists, an analytical approach and a re-composition is often required, so that the potential similarities and differences can be spotted between the original and the image/representation through the “differentiated knowledge” (eidopoios diafora). Through comparison the observer or the thinker acquires the objective knowledge, which allows him to either reject or accept the concept, according to the prevalence of similarities, on condition that the similarities are more substantial than the differences. b. The floor of the Tholos. 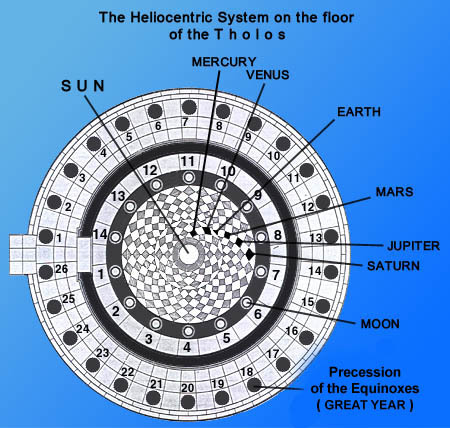 The Heliocentric System on the floor of the Tholos. The names of the planets and the enumeration is the result of the present research. a. The Sun is in the center of both previous designs. 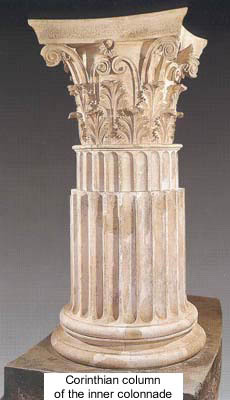 In the Tholos it is represented by the white central round stone. The brightness, the unspotted whiteness is the symbolic characteristic feature of the Sun. b. The orbits of the planets are not circular, but elliptical. On the pavement of the Tholos the elliptical shape of the orbits of the Planetary System is rhomboidal, as this shape is the one that represents the elliptical orbit. c.	The two “inner planets”, as Mercury and Venus are called, because they are between the earth and the sun, have the same pattern as the other four planets (Earth, Mars, Jupiter, Saturn). They are, however, distinguished from them with a separating circle, which intersects the Earth’s orbit. Half of the Earth’s surface is covered and does not appear on the pavement. All the names of the planets, as well as the relation between Mercury and Venus are mentioned in Plato’s work “ Epinomis”. With the separation of the two planetary orbits (the one of Mercury and the other of Venus) from the rest of the planets, the High Priest in Delfi, who gave instructions for the construction of the Tholos, knew their distinctive motions, as they are seen by the observer on planet Earth. Actually the apparent motion of Mercury is an arc of only 28o equidistance from the sun and that of Venus 48o correspondingly. This difference is marked by the intermediate circle, which divides the earth’s orbit and makes only half of its surface seen. Astronomically, however, the orbits of Mercury and Venus follow the same pattern, rotating around the sun, as they are depicted in both designs, the astronomical model and that on the pavement of the Tholos. d.	On both, the pattern of the astronomical model and that of the pavement, six orbits are counted up to the planet Saturn respectively, plus the sun, which remains motionless in its place, as the seventh celestial body. In Plato’s “Republic” (616C – 617C), Plato gives the description of the sky with the stars and the Planetary System. (The myth narrating the rotation of the celestial bodies around the spindle of Necessity). In Timaeus (36 C) he describes the creation of the world according to the cycle of the “tafton” of the stars (26 columns) and the “eteron” (the 6 orbits of the planets). The construction of the Tholos in 360 B.C. coincides with the writing of Timaeus, whereas the Republic was written prior to Timaeus (between 380 - 370 B.C.). The synchronism of the two events, the construction of a monument and the parallel conception of a philosophical theory is, indeed, surprising! The name sequence of the planets on the floor of the Tholos was based on the Hymns of Orpheus, which mention the positions of the moon, the earth and the planet Mars (complete analysis is given in the “Unuttered Words”, chapter 8). The study of the astronomer Const. Hasapis, concerning the Planetary System and the Orpheus Hymns, broadens the spiritual horizon and makes the reader conscious of the very long period of existence of the astronomical Orphic Tradition (“The Orphics” by John Passas, published by ILIOS). a. On the pavement of the Tholos the moon is not close to the earth, despite being its satellite, as it is in the astronomical design. It is positioned after the last orbit of Saturn and its presence is marked out by the full moon of the fourteen days, that is to say, with the fourteen Corinthian columns, where the Planetary System ends. The dark ring, on which lies the colonnade, is the symbolic expression of the dark night. The cella/wall confines our Planetary System in the Zodiac, isolating it from the stars. b. In the astronomical Heliocentric pattern the three newly discovered “outer” planets, Uranus, Neptune and Pluto, follow after Saturn. These planets do not appear in the design of the Tholos as the ancient people had registered only the seven planets (6 + 1 the sun), which were perceptible with naked eye. It is, therefore, natural that they are not displayed on the pavement of the Tholos, although the initiated Pythagorians were aware of them. c.	The colonnade with the 26 Doric columns was erected on the floor of the Tholos after the wall/cella outside the monument. As above mentioned, the symbolic number 26 concerns the fourth cycle of the Precession of the Equinoxes. However, the visitor now knows that it is not the recession of the sun that marks the constellations during its apparent course around the motionless earth, but the marker is the earth’s pole, which rotating clockwise forms the great cycle of the Precession of the Equinoxes. d.	In the pattern of the astronomical model the Precession of the Equinoxes does not appear. The striking similarities of the two designs confirm the foundings of the Heliocentric System on the pavement. The knowledge of the actual course of the celestial bodies was accurately designed. One day this knowledge will affect the health and will transform the level of conscienceness of mankind.